From the author of the international bestseller The Outsiders comes a "stylistically superb" novel that "packs a punch that will leave readers of any age reeling" (SLJ, starred review). Rusty-James is the number one tough guy among the junior high kids who hang out and shoot pool at Benny's. He's proud of his reputation, but what he wants most of all is to be just like his older brother, the Motorcycle Boy. Whenever Rusty-James gets in over his head, the Motorcycle Boy has always been there to bail him out. Then one day Rusty-James' world comes apart, and the Motorcycle boy isn't around to pick up the pieces. What now? 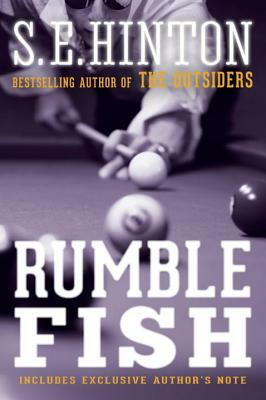 Like Hinton's groundbreaking classic The Outsiders, Rumble Fish was adapted into a movie by Francis Ford Coppola and remains as relevant as ever in its exploration of sibling relationships, the importance of role models, and the courage to think independently. This edition includes an exclusive Author's Note. S. E. Hinton wrote her first novel, The Outsiders, when she was 16. She was the recipient of the ALA’s first Margaret A. Edwards Award, which honors authors “whose books have provided young adults with a window through which they can view their world and which will help them to grow and to understand themselves and their role in society.” The author lives in Tulsa, OK.